Motorola's newest Android smartphone, the $299 Droid Razr, is designed to blend the power of the Droid with the iconic slimness of the iconic Razr, first released in 2004. Judging by my brief hands-on time with this gorgeous device, the Droid Razr should be a blockbuster. First, there's the Droid Razr's good looks and durability. Constructed with Kevlar fiber (manufactured by Du Pont for things like bullet-proof vests) and featuring a steel core and scratch-proof Gorilla Glass, the smartphone feels very sturdy and substantial in hand. It's only 0.28 inches thick--the thinnest 4G LTE phone, according to Motorola and Verizon, and its sleek profile managed to make even my Samsung Galaxy S II look thick by comparison. Distinctive metal buttons and (slightly angled) edging add to the Droid Razr's appeal. The Android 2.3 phone will launch on Verizon Wireless in November for $299 with a two-year contract. One design decision, however, that I'm not sure many will appreciate, is the lack of a removable battery. Perhaps Motorola switched to an integrated battery for slimness' sake or as a requirement for the waterproof feature, but if you're the kind who likes to have an extra battery for your smartphone, unfortunately that won't be an option for you on the Droid Razr. The maker claims an impressive 12.5 hours of talk time, however, so you may not need the spare battery. This long battery life, Motorola reps told me, is 2.5 hours more than the recently released Droid Bionic's battery life rating. I also was intrigued by the phone's Smart Actions feature. 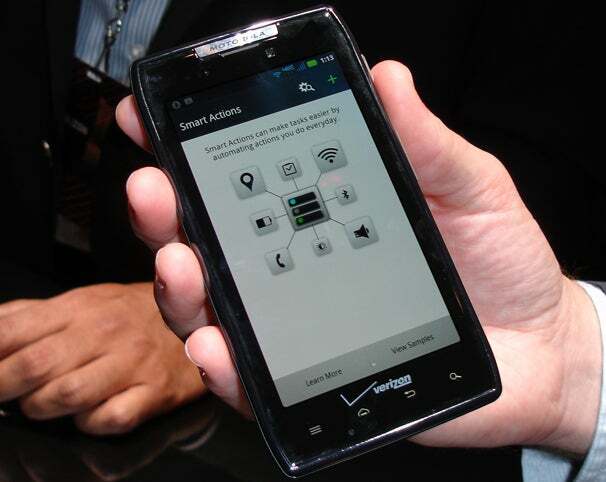 This is the Droid Razr's new customizable shortcuts area, which Motorola says will save battery life and quickly launch common tasks. Besides look and feel, the Droid Razr felt impressively zippy in my quick tests, no doubt thanks to its dual-core processor and generous 1GB of RAM. For instance, when I switched from QuickOffice to the browser to the Gallery and back, it felt instantaneous. Having had bad experiences with MotoBlur and its overwhelming social widgets on the Motorola Cliq, I was glad to see a lack of cluttered MotoBlur UI widgets on the demo devices. Instead, the Droid Razr, on first look, appears and acts like a serious smartphone: Fast, tough, and beautiful.